HEYGATE TIMELINE | Southwark Notes - whose regeneration? What follows is a simple cut and paste (1st Sept 2014) of the excellent and ever expanding and crucial Elephant and Castle / Heygate Estate ‘regeneration’ timeline done by some former residents of Heygate. We have used the main text from that Heygate Was Home timeline but the original website contains loads of links for the documents, films and other material it mentions: Check interactive HEYGATE TIMELINE here! We will try to update this page as much as we can and also to add in from our own archive relevant material. Wish us well. In October 1995, Southwark Council’s Regeneration & Economic Development Sub-Committee (REDS) approved the launch of the Urban Design Campaign as part of the Southwark Urban Design Initiative. The Southwark Design Initiative was aimed at creating a cultural quarter in north Southwark stretching from the Tate Modern to the Elephant & Castle. The initiative was driven by Director of Regeneration Fred Manson, an ‘urban renewal’ specialist from the US, who has co-authored books with Richard Florida – inventor of the ‘Bohemian Index’, and is a member of the TTT think tank, and the Creative Cities Group. In January 1998, Southwark Housing commissioned ‘NBA Consortium Services Ltd’ to carry out a comprehensive survey of its housing stock. The survey – which took nearly 2 years to complete – predicted an estimated cost of maintenance for the council’s entire 40,000 homes in its housing portfolio over a 30 yr period. Maintenance costs for the Heygate estate were estimated at a total of £21,742 per dwelling over 30 years, below average for the rest of the stock, which was estimated at a mean average of £23,363 per dwelling over 30 years. This Strategic Committee report from June 1998, shows that the decision was taken to demolish the Heygate prior to the results of any consultation with residents or options appraisal study. It states the need to move quickly as the Elephant is in competition with strategic locations in other boroughs in attracting investment and unlocking “unrecognised economic potential”. The report confirms that maintenance and repair work on the Heygate estate is being deferred in anticipation. Other Council papers described the estate as “outmoded” and “unpopular social housing’ in an “underused brownfield site” which is “out of place in a city fringe location”(para. 7.22). It was also stated that “demolition and redevelopment would allow the Council to realise the value of this strategically placed site”(para. 3.9). Having denied residents a ballot on the future of their homes, in April 1999 Southwark conducted an opinion survey of residents’ views regarding the different options for regeneration explored by the options appraisal study. 70% of residents said that they wanted to move to a new home on the site of the Heygate estate. 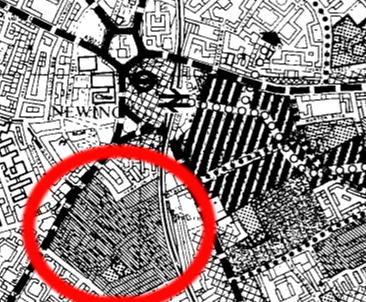 Southwark later rephrased the results and used them as justification for its decision to demolish the estate. See numerous council papers including paragraph 2.9 of the council’s Statement of Reasons for its Compulsory Purchase Order application to the Secretary of State. Developer Godfrey Bradman (‘SLR’ Ltd) is selected as preferred partner for the scheme and a ground-breaking tripartite structure is set up to give ‘third-developer’ status to a community forum representing the interests of the local community. The core component of the SLR scheme is tackling the car-dominated layout of the Elephant by replacing the link road with a new public square. According to council papers the deal would provide southwark with a cash payment of £250m in return for its land interest in the Heygate plus 70% of the surplus profit and £250m worth of public infrastructure. SLR’s masterplan also includes a large public park on the site of the Heygate estate. The plans also include replacement social housing for Heygate residents under the auspices of a Community Land Trust. After the SLR plans collapsed, Heygate residents started pushing for a refurbishment programme. In response, the Council misinterpreted the results of the 1999 Heygate MORI opinion survey to claim that 62% of the estate’s residents wanted to see the estate demolished ([Option 2: Demolition – 32%] + [Option 3: Partial demolition & refurb – 25%]). The Council also claimed that it didn’t have enough capital to fund refurbishment works. Unfortunately, effective scrutiny was compromised by a power struggle within the Heygate Tenants & Residents Association (T&RA), which saw it co-opted by the incoming Lib Dem administration. The following year Chair of the (T&RA) Maggie Ambrose was forced to step down by the Standards board due to conflict of interest (she was also a newly-elected Lib Dem Cllr). After a short hiatus, the incoming Lib Dem administration promised a fresh start for the Elephant regeneration and instructed Ken Shuttleworth from Foster & Partners (later under his own company ‘Make’) to create a bold new masterplan for the E&C regeneration. This time there would be no third party to the negotiations and little community involvement; the council would control and set out the masterplan which a selected development partner would simply implement. In December 2002 it published its ‘Emerging Framework Principles’ document setting out its vision for regeneration which culminated in the June 2003 draft SPG and search for a new development partner. In 2004 the London Development Agency launches its ‘Creative London’ policy manifesto, in which the Elephant is one of 10 ‘cultural hubs’ around the capital, which ‘will act close to markets and connect creative minds to entrepreneurial spirits’. £56m of funding is identified – including contributions from both the Arts Council and private sector (property/regeneration). After two years of drawing up its plans behind closed doors. In July 2004, the council published its 2004 E&C Development Framework SPG. The Mk 2 vision drops the original plans to replace the link road with a public square and instead proposes the penisularisation of the northern roundabout. The new masterplan has been created with the intention of “establishing Elephant & Castle as a new cultural entertainment/creative business focus.” The public infrastructure proposals in the masterplan include an arts & cultural facility, a ‘performance square’, a theatre, a museum, a library and a secondary school. A major component of the new masterplan is to build a ‘MUSCo’ biomass combined heat and power plant (wood chip boiler and steam turbine) and draw a water supply from a chalk aquifer bore-hole. The ‘radical’ green initiative to create a carbon neutral development draws worldwide appraise including a visit from Bill Clinton. ‘O-Central’ later formed the basis for a 2009 photo-essay about the development’s new residents by UAL student Freya Najade, which formed part of a book and ongoing project by the UAL to document the regeneration. The council spends £0.5m on re-branding and showcasing the new vision for regeneration, which besides the railway concourse, civic square and transport hub, also includes a theatre, a new secondary school, a health centre, a new library and new childcare facilities. In issue 2 of its Regeneration Magazine the council’s project director Chris Horn declares the rehousing plans “groundbreaking and revolutionary”. Mayor Ken Livingstone called for an investigation by the CRE (Commission for Racial Equality) into the E&C regeneration scheme. The call came after it was found that 35 recommendations made by Lord Ouseley in his damning March 2005 review of the Council’s racial equality policies had not been implemented. Lord Ouseley claimed that he felt his review ‘may have been used not so much to uncover any wrongs but to help cover them up’. 28 Heygate residents participated in selecting the architects to design their new homes on the 16 replacement housing sites. This Jan 2007 newsletter invites other residents to get involved with the detailed design of the new homes and further invites them to “start thinking about the layout and decoration of your new home”. The Lend Lease consortium wins the bid to become the council’s selected development partner. The Lend Lease consortium also consists of partners First Base (a Lend Lease subsidiary) and Oakmayne Properties Ltd. One of the losing bidders is owner of the shopping centre – KPI St. Modwen. This would create problems later with bringing the shopping centre site forward for redevelopment, as Lend Lease later refused to underwrite the Compulsory Purchase costs for the shopping centre, despite it forming part of Lend Lease’s procurement bid. Despite the fact that none of the 15 ‘early housing’ replacement developments had yet been built or even granted planning permission, Southwark suddenly decides in Sep 2007 to bring forward the decant and demolition of the estate. Instead of waiting for the replacement housing to be built, it claimed that “Demolition of the Heygate will provide symbolic and tangible evidence to the people of Southwark that the Council is driving ahead with the regeneration of the Borough”[Heygate Action Plan – Para. 8]. The decision came as a complete shock to residents, who were given no advance warning of it, and many of which were still involved in the process of helping to design the new homes that they would now no longer be getting. They were told they would be ‘decanted’ temporarily into existing council stock elsewhere in the Borough and given the opportunity of signing a ‘right to return’ to the new replacement homes at the Elephant once they had been built. However, this ‘right to return’ document contained a clause stating that it is only valid for a period of seven years. This report shows that by 31 Oct 2008, the estate has been half emptied and that most of the remaining residents are elderly: “The majority of residents who have neither a direct offer nor homesearch offer in phases 1 and 2 are elderly”. The same report also highlights the difficulty of trying to decant 1,100 households into existing void properties when there are no more than 35 void properties available to bid for every fortnight (Homesearch = the council’s existing stock bidding process). Council documents tabled during the later CPO public inquiry showed that eviction proceedings were taken against a total of 198 households during the Heygate decant process. Instead of the new homes they had originally been promised, Heygate residents are offered ‘Happiness Therapy’ with Happiness guru Robert Holden. Holden works in the field of positive psychology. He holds a doctorate in happiness, is the author of best-selling book ‘Shift Happens!’, the star of a QED documentary series, and is considered “Britain’s foremost expert on happiness”. In June 2009, having ‘decanted’ most of the estate’s residents into existing council stock dispersed throughout the borough, the council executive confirms that 6 of the 15 proposed early housing sites have been removed from the programme due to viability issues. By now, only one of the early housing sites has actually been built and only a further four have planning permission. The last remaining tenants on the estate are offered guided tours by the council in order to help them ‘find out more about what different areas of the borough have to offer’. In an effort to speed up progress, the council decides to switch off the district heating and hot water supply to the Heygate’s few remaining tenants and mainly leaseholders. Residents are originally informed that there had been a ‘major burst’ and that the system is beyond repair. But it later emerges that the council had planned to switch off the system weeks before the ‘major burst’. Having taken power in the local elections of May 2010, the new labour administration hastily concludes negotiations with Lend Lease, and signs the final Regeneration Agreement honouring its manifesto pledge of delivering the regeneration plans after “8 years of dilly-dallying by the Lib Dems”. Opposition councillors accused the new administration of ‘squandering a £26m captial receipt in its rush to sign a deal’. Tom Branton, the Council’s lead officer in charge of the procurement process and the negotiation of the Regeneration Agreement, left the Council later that year to take up a management position with Lend Lease. In conjunction with its plans for a ‘creative hub’ at the Elephant, Southwark Council instructs a communications agency to make a promo video and produce a ‘cultural vision’ with local arts individuals, groups and institutions launching a manifesto for a ‘Dynamic, Innovative Creative Economy’. The previous planning framework (2004 E&C SPG) outlining the plans for the Elephant is hastily shelved and a new masterplan is quickly drawn up (2012 E&C SPD), which is more in keeping with Lend Lease’s objectives. Whilst planning policy is usually set out by councils for developers to adhere to, in this instance it has been drawn up entirely according to the whims of the Council’s development partner. Most of the public infrastructure promised by the previous masterplans has now been shelved (arts and cultural facility, ‘performance square’, theatre, museum, library, secondary school) The MUSCo biomass plant was also scrapped after being deemed no longer viable and described by the Council’s own cabinet member for regeneration as a ‘fantasy project’. The masterplan now consists almost exclusively of the construction of new residential and commercial floorspace, very little of which will be affordable to those currently living or working in the area. Global architect Gensler completed a design and cost appraisal study showing that it would cost just £35m to redesign and refurbish the estate – around half the amount the council has spent on emptying it and progressing the redvelopment (£65.4m – see paragraphs 5.34 & 5.35 of Project Director’s CPO evidence). A campaign is mounted by local residents in response to the outline planning application submitted in March 2012, which initially contains no guarantee of any affordable housing. After a concerted campaign the application is revised and re-submitted with a guaranteed minimum of 25% affordable housing. However, instead of the social rented element required by policy, the application proposes the new ‘affordable rent’ tenure (up to 80% market rent), which can be more than twice as expensive as social rents. The outline and phase 1 applications propose just 79 social rented homes out of a total of 2,535. There are well over 300 objections to the applications, and the planning committee hearings are so full that many objectors are refused access. Page 6 of the planning officer’s report on the application confirms that just 7 of the early housing sites had been completed by Jan 2013, providing a total of just 90 social rented homes out of the 1,100 new replacement homes originally promised to Heygate residents. It also confirmed that just 45 former Heygate households out of the total 1,100 were residing in these replacement homes. Sport England, the Government body responsible for community sport, criticises Southwark Council’s plans to reduce the sports facilities at Elephant & Castle Leisure Centre. It lodges a formal objection to Lend Lease’s ‘One the Elephant’ residential tower that will replace the former leisure centre with much smaller facilities. Claims that the Lend Lease tower would be subsidising the new facilities, were later found to be false when it emerged that the capital receipt was just £6.5m – well short of the £25m total cost to the Council of building the new leisure centre. The estimated cost of refurbishing the leisure centre was put at £8m in 2010. At least 40 local residents and objectors were excluded by officials from the Heygate planning application hearing at Southwark Council HQ. They were told by Councillor Bukola that they couldn’t enter the public meeting because there was already “sufficient representation from objectors in the room”. The public inquiry into the Compulsory Purchase Order for the Heygate estate in February 2013 brings out some interesting facts. Whereas the original 1970s slum clearance saw an entire community moved from a neighbouring clearance area onto the Heygate, this time round the community had been scattered: just 1 in 5 Heygate secure tenants remain living in the SE17 postcode and the vast majority of Heygate leaseholders were forced to the outskirts of London with the low compensation offered for their homes. Evidence given by the Council’s project director(see para. 5.16) shows that just 45 of the estate’s 1,034 tenanted households had moved into the replacement ‘early’ housing sites (only 7 of which had so far been built, comprising a total of just 90 social rented homes). A Council blunder reveals that it will be making a loss on the sale of the Heygate estate. The accidentally published Regeneration Agreement between the Council and Lend Lease shows that the Council will receive a cash payment of just £50m in return for the 23 acre site. This will fail to cover the £65.4m costs it has incurred in emptying the estate and progressing its redevelopment (see paragraphs 5.34 & 5.35 of Project Director’s CPO evidence). The Council is entitled to a share of the overage profit (share of any surplus profit after the developer has taken 20% profit-on-cost), but the Council’s Cabinet member for Regeneration acknowledged that there is unlikely to be any overage profit. The Council leader and Chief exec come under criticism for undertaking a trip to global real estate trade show MIPIM in Cannes paid for by Lend Lease. The controversy came just months after the Leader was investigated for not declaring Olympics tickets donated to him and his partner by the Australian real-estate development giant. The Information Commissioner issues a decision notice ordering Southwark Council to publish the full financial figures relating to the Heygate redevelopment. Just weeks after the announcement that the remaining leaseholders had lost their fight against the CPO order slapped on their homes, Lend Lease unfurls a 7 storey advertising banner playing on the infamous ‘Now Here’ graffiti – part of a detailed academic critique of the estates’ regeneration. Southwark Council appeals to the Information Tribunal against the Information Commissioner’s ruling. Lend Lease is added as a joint respondent to the case, in which it is arguing amongst other things that disclosure of the information is a breach of its human rights as a legal person. The last remaining leaseholders on the estate are evicted by controversial bailiff company Shergroup Ltd. The £7,000 bailiff costs are subsequently deducted from the council’s low compensation payment for their homes. In response to press criticism that the 179 leaseholders on the estate had been priced out of the borough, Cllr Fiona Colley admits that “there are a few people who owned their own property on the estate and didn’t want to leave, and who may have to move a little further out to find an equivalent property. However, the council did offer them assistance to stay in the area – for instance they had the opportunity to enter into a shared ownership deal at the Strata Tower in the heart of the Elephant.” Reports show that just 5 leaseholders took up the shared ownership offer. It is announced that developer Lend Lease is to be sued for the practice of blacklisting employees who are involved in union activties. The news comes just 6 weeks after it is revealed that some contractors on the Heygate site are being paid just £6.30 per hour on zero-hour contracts – well below the London Living Wage requirement stipulated as a condition to the granting of outline planning permission for the site. The Heygate Pyramid planning application by Artangel – submitted within a week of the last resident being evicted – is rejected by Southwark Council. Despite the council having spent much time working up the proposal in conjunction with Artangel and Lend Lease, the proposal was dropped when the council bowed to pressure after it came under fire from former and local residents for being insensitive. The few former Heygate residents who had managed to secure rehousing in one of the so-called ‘early housing sites’ report serious structural defects in their new homes. Water ingress and damp in this award-winning scheme leads one former Heygate resident to claim he would rather return to his old home on the Heygate – “I wonder why I signed the papers, I wish I could go back”. After a 6 day hearing in February 2014, in May the Information Tribunal issues its decision ruling against Southwark Council’s appeal. The Tribunal rules that 3 of the 22 appendices can be witheld, but the viability assessment itself and remaining appendices must be disclosed. Council papers show that “The total estimated cost for the appeal is £57,920 plus VAT, of which about £40,250 will be funded by Lend Lease. Kim Humphreys, the former Deputy Council Leader and Cabinet Member for Housing responsible for the shameful Heygate decant, reappears at the Elephant as a development consultant acting for developer Delancey. Humphreys has set up a consultancy called ‘Carvil Ventures Ltd’, which provides developers with ‘the keys to unlock successful real estate development’. In addition to conducting its obligatory community consultation exercise, Humphreys has been instructed to advise Delancey and help negotiate its planning contributions for the shopping centre redevelopment.